By default all wines will come under a winery bond in vintrace; this is derived from the wine's location. AP bonds, however, are derived from the owner of the wine/batch. If the wine is under an AP or Composite/non reporting bond, that bond will take precedence over the winery bond regardless of location (within vintrace). Movements between bonds in vintrace will impact the 5120 reports for both bonds. The original bond will show a Removed in Bond amount on the Bulk wine section. The new bond will show a Received in Bond amount on the Bulk wine section. Using this method you will need to perform a Change Batch operation on the wine, this will both change the name of the wine and the owner at the same time. The Change batch operation can be found in the Operations menu when looking at the tank/wine in the Product overview. 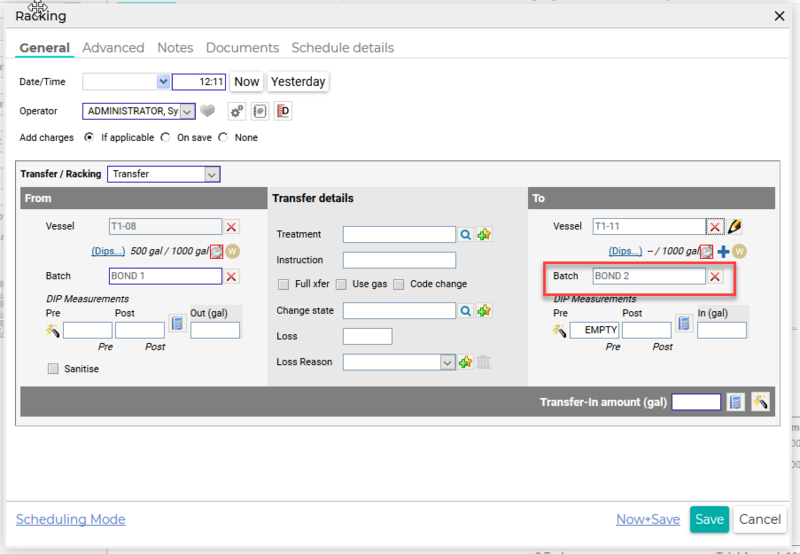 During the Change batch operation you will want to create a new batch via the Plus Star icon in the To Batch field. When creating the new batch you will be able to set the new owner to a owner in vintrace with a different bond attached to it; generally this will be an AP bond and we advise that these owners be set up in the Address book with AP as a suffix to make identifying them easier. Once the change batch is saved you will receive a confirmation warning that the wine will be changing bond. The transfer method is similar to the Change batch method, but involves a transfer to change the wine's vessel. This can be done via the Operations > Transfer/Rack/Blend, one-to-many, or many-to-one transfers. On the destination/right hand side of the operation you will need to replace the Batch with a new one, via the plus star icon, making sure to set the new batch’s owner as the AP owner. When you save the Transfer, the wine will be moved to the new vessel/batch/owner/bond and you will receive a confirmation warning about changing bond. If the wine is in a barrel group, you can use the green arrow (Move/relocate barrels) to the right of Location on the Product overview. If the new location is covered by a separate bond, vintrace will detect that change and ask you to confirm the change of bond. This is most commonly used when moving barrel groups while performing an inter-winery transfer (when you have a multi-winery set up). This does not apply to dispatching to a third-party location. This method allows you to change the bond of the wine without changing the Batch code/name, but requires a extra step for reporting purposes and is best used for batches that contain a single wine component. The change owner method can be performed via the Change owner operation; this can be found by clicking Operations in the Product overview. Click Owner, and change from the previous owner to the AP owner. On saving you will be asked to confirm the change of ownership and the usual change bond confirmation screen. Confirm the change of ownership by clicking OK; click OK to confirm the bond change. After the change owner is complete you will then need to perform a Measurement on the wine without changing the volume (zero loss/gain). The Measurement operation is important for reporting purposes as it locks in the bond change as of the date/time of the measurement. When you are changing from a custom crush owner, from another AP02 owner, or from a non-tracking (Composite bond) into a regular AP02, the Change owner method is the most straightforward and will show the correct entries for the two 5120 reports. The Measurement operation is particularly important for this type of bond change.